The following post, Attachment Parenting and Autism, has been submitted by Amy as part of the AP Month 2009 blog carnival. If you are interested in participating in the carnival, view the AP Month 2009 blog carnival information post. If you’re like Amy and don’t have your own blog, you can email your submission to API and we will publish your post and include it in the carnival. I didn’t choose AP as much as Daniel chose it for me. He was a relentless child, even in the womb, who moved, rolled, hiccuped constantly. I gave in 1/3 out of love, 2/3 out of sheer desperation and need for survival. He was only happy being held, so I held him. He would only sleep next to me, so I cuddled him. I breastfed at will and watched my son thrive. He weighed well over 11 lbs at only one month old! He grew, beautiful and perfect. He hit milestones and we celebrated. He was very attached, as was I. I couldn’t stand to be without him. I grew weary of justifying it to the world; I truly enjoy the company of my child! We enjoy co-sleeping and breastfeeding. I can’t tell you when he changed. Looking back, there is no particular “ah ha!” moment. I know that one day Daniel said “Hat!” and I rejoiced. It was our first new word in months. I began to notice that my child could say “hat” and little else. He moved constantly, always on the go. He was into everything and still would not talk. When his peers were making simple sentences and observations, we still only had “hat.” Words were slowly disappearing. We justified, blaming our recent moves, new baby and changes in routine. No one ever mentioned the evil A word. I viewed it as an unspeakable curse. My son could not be autistic; he cuddled, hugged and smiled. But he avoided gazes, lined, stacked and wreaked all forms of hell in any environment and had unmanageable tantrums. After therapists, evaluations and a long list of doctors, my fears came to light and I learned that my beautiful son has autism. So many things he did, and still does, are blamed on my parenting style. I was told for a year, as I searched desperately for answers that he would speak when I stopped hovering. I was told to stop meeting his needs, tune him out and make him ask. My radar was so strong I could anticipate his every need without his request. I was told constantly that he was bad and should be spanked. The pressure to physically and psychologically control my son was constant. Discipline through physical violence is the magic bullet theory of parenting. Somehow, spanking makes children eat, sleep and be quiet. Whipping can make a child stop crying. If they hit, hit them back, only harder. Daniel’s behavior grew more and more erratic. We both became frustrated. I had no way to communicate with my son except through love. Cuddling, being close, kisses, rocking, calmed us both. During the darkest days, the strength of our attachment got us through in one piece. Knowing how well I know my son made me push even harder for answers. I often feel like the captain of a ship lost at sea. On a daily basis, it feels that I am struggling just to keep all of us safe and alive, navigating the responsibility and sorrow of having a child with autism. Attachment principles have served us well. When he tantrums in public, I break out my trusty ring sling. At 40 lbs, he’s getting to be too much for my hip to handle, but it always works. The closeness calms him instantly. He loves to co-sleep and still insists on being rocked. We now understand that his sensory needs make it harder to fall asleep, that he truly needs to be rocked and it would have been cruel beyond words to leave him alone to cry it out. It would be easy to just give in, take the “firm hand” that so many books and doctors stress to me. But it would not work for us. I believe that he is as bright, friendly and cooperative as he is because of the gentle parenting he has received. He is a curious and trusting child because he learned early on that he could trust me. Yesterday, we celebrated again as Daniel turned three. He is still the same wonderful little boy; beautiful, active and growing so big! Hearing him laugh and attempting to say a few words warms my heart beyond measure. Seeing the happiness on his face makes it all worth it. It makes me want to keep going, keep pushing, to help him be the best Daniel he can be. I am unsure what the future holds for my son. He responds well to all his therapies but I know that he will always be a little different. I know the best thing I can do for him is to give him what he needs: kind, loving and respectful parenting. Amy is a stay-at-home Mom to two little boys who loves sewing, scrapbooking, cooking and gardening. She is a member of Baton Rouge Attachment Parenting group and volunteers her time as a breastfeeding peer counselor. As a teacher for children with Autism and the sister of who’s brother is severely Autistic, I enjoyed reading this article. In our training, we focus a great deal on the sensory stimulation (i.e. from water play, trampolines, bubbles, hand massages, etc.). It really does help them calm down. 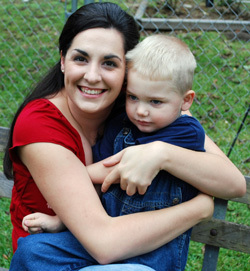 I’m glad that AP parenting has benefited Amy and her son. What an incredible journey you have had, thus far. Your commitment to AP is so admirable. What your son needs most is love and you will never hesitate to give that to him. Amazing. You are truly an inspiration. Good for you for listening to your heart instead of other people’s opinions. My son (now 4) also chose AP for us. At first, it was hard to be different from our “cry-it-out” friends but now I am confident that we gave him what he needed. When my daughter came along (now 1) she also was only content in mommy’s arms. It has been the more difficult choice to AP, but easy doesn’t usually = better. Congratulations on being a great mommy!! I think that Daniel is really lucky to have you as his mom, responding to his needs as you do. Thank you so much for sharing your story with us. I am so proud of you for doing what you knew was best for your son despite the pressures from others. It helps me to continue holding strong to my parenting beliefs, even though everyone around me–doctors, friends, family, often encourages me to do otherwise. You put it beautifully, and I wish you well on your journey with your beautiful son! Thank you for sharing. I’m so glad I found this blog post. I can relate on so many levels. My daughter was just recently, at 5, diagnosed with Aspergers. I am an attachment mommy as well. I’ve been blamed and criticized and yet I knew I was the only one who got her. There is a really good reason we were chosen to be their moms. Again, thank you! You are my hero. Thank you for leading by example. Of course I especially love that you breastfed him at will! Good for you! You are telling my story! We too are parenting a child who has autism even though we have started therapies and the actual diagnosis hasn’t been written we know. We know in our hearts he is diffrent. We are thankful to AP because without it everything from the tantrums to bed time would be worse. Thanks to co-sleeping, gentle discipline and constant connection our son thrives in the best way he can . Thank you for sharing your story and showing us we aren’t alone. Please investigate the DAN (Defeat Autism Now) protocol. Many children can recover from symptoms of Autism with the gf/cf diet, along with other interventions. A list of practitioners can be found here http://www.autismwebsite.com/practitioners/us_lc.htm . Our son lost two years of his development because we didn’t know about the protocol. He’s 12 now and passes for neurotypical. It’s been a long road back to recovery but it is possible. i am so proud of you. you are an awesome mom!!!!!! My son, christian is now six years old, and your story sounds almost identical to mine, except I never knew about AP until now…I used almost all of the methods, but I couldn’t breast feed as my son is lactose intolerant. i had always been told by other mothers (outside of my family, as I learned how to parent from my mother who has always been a nurtouring and wonderful mother) that I needed to spank or that they didn’t know how I never lost my temper or patience with my son..;. He just turned 6, is still “co-sleeping” and I know in the future he will go into his own bed, but right now, I know he is safe, happy, healthy boy that makes every day happier when spent with him! I wish I woulod have known that AP style parenting had exsisted a long time ago! Also, as for your son not talking yet…My son only said 3-5 words consistantly until he was approx 3 1/2 and then one day its like he started talking overnight! I started using pecs charts, that I bought off of ebay. do a search on them and look into using them as it really does help a lot! Good luck & it sounds like your boys are very lucky to have such a wonderful mom! I’ve espoused this sentiment about my own child so many times and am thankful I have chosen a gentle parenting style for my special child. We cosleep and nurse on demand and I try to see his point of view when I guide and discipline. We aren’t AP posterchildren – I work full time and we never got the hang of our sling (I carry him in my arms) – but that hasn’t stopped me from applying AP as best I can. Thank you for the encouragement. My four year old son has autism and after 3 1/2 years we decided to have another child. I kept my mind together to avoid the anxiety of having a second child with autism, but now that she is 2 months old, I find myself constantly thinking about it, and so inevitably I mentally evaluate everything I did with my son, and attachment parenting was one of those things. At first I worried that rather than it being that I practiced AP itself, that it was actually that I was extremely terrible with the balance part of it, and so it very well could be that I did in fact ‘spoil’ my son, not because I held him or let him sleep in my bed, but because I was so intimidated by baby cries that I didn’t meet all of my own needs very well all the time, so it caused me to burn out, and my diet was far from the best with breastfeeding as well. I also worry that the fact that I exclusively breastfed him could have caused autism, especially when he is the only child in my family with autism, and yet the only one who was exclusively breastfed. I was also exclusively breastfed as an infant because I would not accept any substitute. Yet I can’t come to terms with the idea that exclusive breastfeeding in and of itself can cause autism, not when that’s the way babies were intended to be fed. A much better option is to assume that the breastfeeding mother must hold herself to a high standard when it comes to diet and self care. I also feel like some close ppl in my life have judged my decisions and blamed my parenting for my son’s behavior, saying the autism thing is just a label, and that he may be ‘indulged.’ I don’t think a four year old could pretend not to be able to speak for four years (with occasional speech here and there) because he is so spoiled rotten, especially when he never developed to the point of understanding what it means to tell a lie or play pretend. 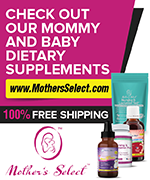 Furthermore when my son was not walking at 17 1/2 months, my cousin in-law’s wife told me I needed to give my son Pediasure because he needed certain vitamins and nutrients to be able to walk. Ironically he did start walking when I started giving him pediasure, but I think it was because he observed his peer cousins walking, not crawling around. Also, it could have just been time, he stood up without support a few weeks before, then started to walk. Also, the pediasure and cow’s milk that they thought he so desperately needed should be blamed for the fact that my son completely regressed around 2 years, 6 months after he had left the breast, most likely due to having received too many other forms of milk. The best I feel I can do with my daughter is an autism diet for myself, plus dietary supplements, probiotics, and a good naturopath. My hope is that I can prove this attachment parenting/autism theory wrong some day. Also, as far as spanking goes, even mainstream autism gurus disagree with spanking autistic children, so that does not spoil them, and I know a family who spanks their autistic child, and he still continues to hit people and exhibit drastic misbehavior. My son did not develop a behavioral problem until I was about 4 or 5 months pregnant, before then he was well known for being autistic, without behavior problems, and he has never ever been spanked. I think that with autism you can’t reinforce negative behavior by being positive, with a child on the spectrum, I think in some cases it’s totally appropriate to show your child affection when he is exhibiting aggressive behavior. you will have to one day let him cry it out if he is to survive in this world. Ap is spoiled and a blessing. A blessing not every mom has the opportunity to give. There is good and bad in everything, but I am sure you will come to find out in years to come esp 6-7 and on that you may wish you made different choices. They do learn when forced or spanked faster than any other child ive seen. You wont always be there. What if your husband leaves you or becomes a drug addict and you have to put those lovely children in a daycare on a schedule and you can no longer cater to thier every need. what happens when school cant. You probably are not properly preparing your child for the world who will not cater to him. Its not right or wrong. But that child will be one day too big for you and what are you going to do with a 20 year old tantruming child call the police and have him locked up? 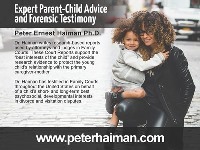 IFor the love of your child and your family I offer this insight from my experience with ap to you. Our journey as parents of autisitic children is like no other. good luck and bless yourself everynight for you are his angel and lifeline. Your amazing for everything you do dont ever forget it! As far as preparing children for the real world, the real world is equal to the sum of its parts. What if husband becomes a drug addict? My husband would not be interested in attachment parenting if he were tempted to do drugs, it would be most unappealing. My husband has never done drugs in his life. On the other hand, as a teenager I smoked marijuana habitually for years, and who knows, I wonder if it has anything to do with the fact that I was spanked on my bare bottom with a belt and grew up with asperger’s syndrome yet no one had any idea. AP prepares them even better for the real world, because when a child’s needs are met by parents who are able to meet them, they are able to handle the changes in life later on. My son with autism slept in our bed for four years, and when I was 2 months pregnant we transitioned him into his own bed in one day by simply making his new bed just as comfortable as ours, and agreeing that if he wakes up crying, my husband would respond to him, given that soon I wouldn’t be able to be the one to do it. He handled all this with no problem at all, and that’s why I’m not afraid. Even if something did change and I had to lessen the amount of baby b’s I could provide, attachment parenting is not all or nothing. I would still bed with my daughter, breast feed when I can and wear her when we are together, and I would demand the same of her caregivers. Yes she would have to experience frustration, but ap does not profess to ridding children of frustration. American babies cry regardless of how they are parented because of the culture we live in, the isolation, the whole one parent show with no helpers thing, that’s why our babies cry more than those of other cultures. None of us can provide the level of ap that babies in other cultures receive. My baby gets frustrated all the time, but I am not afraid of her emotions like PDF parents are, if she cries and I cannot meet her need immediately, I wear her and talk to her, I comfort her, but I continue to meet my own needs. If AP spoils children, explain why my son is not spoiled? All of the babies who were not held, at one year of age, are extremely clingy, all the ones I have seen, but my son didn’t want us to hold him, except on the occasional check in for a hug, or reassurance when he had fallen or hurt himself. He didn’t want to be held all the time anymore like he did when he was a little baby because that need was already fulfilled. AP does not cause autism because there are lots of pdf babies who have autism as well. My dd was held and she is still clingy. Hi :). Thank you for all of your sharing. I came across your article when researching my idea that AP parenting may decrease the severity of autism. My son is 10 and exhibits many autistic tendencies (especially the sensory issues and meltdowns). As an AP parent and a homeschooler, I chose not to have him assessed as a small child, believing if I raised him as an individual and was sensitive to his needs all would be well. Recently I came to my wits end. I was afraid of the potential damage his behaviour might cause to his five siblings, so I took him to be assessed. The assessment team refused him an opportunity to see the OT, and they said his learning difficulties were because I homeschooled. They practically ignored my reports of his meltdowns, because he passed all of their tests to a high level and did not tick all the autistic boxes. Since then I have spend hours reading about autism and Aspergers. I have racked my brain about his early years. In the process I have realised both my husband and I are high functioning autistics. I believe my son does have autism. I believe the reason he doesn’t tick the boxes, is because of attachment parenting and homeschooling – our natural early intervention has fixed so many of the autistic tendencies. Who better to teach an autistic child how to make his way in the world, then two loving autistic parents who have succeeded in doing so already. What a beautiful story! I found this blog search for AP and ASD associations because once I heard that AP actually helps prevent autism in the way that you form a connection with the child regardless of the developmental disability. My story varies a little, but my son is 4.5, diagnosed with ASD. I believe he won’t qualify for the diagnosis for much longer. I practice AP and Floortime with him for years and it is so wonderful to see the long-term and to think that perhaps my parenting style had some impact in his amazing success! Of course I had everyone in my family disagree with me about my parenting style (and it may have had a hand in my divorce). But I look back and in hindsight those disagreements are so small in comparison to the impact this has had on my son’s life. And even now my family says in hindsight that I was right about it all along. Funny, about the time they stopped complaining and started agreeing with me on co-sleeping was when we decided it was enough! You’re doing great! I enjoyed your article. I also follow attachment parenting and have been criticized numerous times, especially by my lovely in-laws. They have accused me of giving into my son too much and have told me to spank my son (who was one at the time) because he didn’t want to eat when he was over-tired. My husband and I still follow attachment parenting and love it! Co-sleeping is wonderful. We redirect out son gently and he responds very positively to it. Your article was very encouraging. Lots of love is exactly what all kids need. No doubt you’re an awesome mom but some things definitely could have maybe helped protect him from his diagnosis such as not over-responding to his needs… It is good for them to ask, they have to understand that they need to use their words. It’s great you are so good at reading his needs but that’s no benefit to him if you don’t give him a chance to express them! If he is over-parented this way in other areas it may cause problems too. You pick him up when he has a Tantrum to stop it? Why not help him to overcome it, talk it out, deal with it… Not run from it. It’s a natural emotion to feel sad or angry… So why pick him up straight away and deny him that feeling? And the opportunity to practice his emotional control? It would give him a great degree if emotional maturity. Thank you, Kate, for sharing your ideas. We need to remember to be respectful of one another, even when leaving written comments on the blog as opposed to speaking to one another in person. The goal is support one another by sharing our experiences and empowering others. For some people, others’ approaches to parenting may seem like over- or under-parenting, but if it works for that family, it is “just right” parenting. And by responding with sensitivity, appropriate to each individual child’s development, parents can be assured that they are meeting their child’s emotional needs while gently guiding their development. My son is 3 and diagnosed with autism. Its always amazing to me that AP is often judged so harshly as spoiling when it is completely in line with the infant mental health research that has been done. And for the parent of a child with autism? The judgment is staggering. I agree 100% that AP is therapeutic in and of itself for our children! I believe it really makes a difference with the spontaneity, reciprocal joy, decreased anxiety, and social interest, which is exactly what we are supposed to be targeting. Still, services are so important for stimulation, and I have been on a mission to find services that are not punitive and that complement AP parenting. DIR Floortime, Play Project, and Early Start Denver model, all focus on promoting the child’s interaction with others with joy (finding the smile), vs physical restraint, excessive witholding etc. It’s awful that the therapeutic norm these days seems to make mothers feel guilty for AP parenting with special needs children when in fact maintaining that earliest connection with mom is what will most provide the anchor and desire to connect with others in the long and short run. I feel bad because my son is almost 8 and he just pushes me away when I try to comfort him. He constantly tries to swing at me and bite his hands. I really wish that AP could work for him. There is really no parenting theory that does. I cannot imagine what he would be like if I spanked him?! All I can think to do is keep on showing him love. Sometimes I have to give myself a break from it though, attend to my other child, brush my teeth. I just wish that love were enough for him, because we are on long waiting lists, and his speech therapist said she does not know how to help him. I wanted to homeschool him to see if I could better our relationship. I am trying not to give up. He will be home for the summer so time will tell. I enjoyed this blog. I see that it is from 2009. I would love to read how Amy and Daniel are doing now?